I lived in Matsuyama, Japan from 1990 to 1992, teaching English and studying kendo, Japanese fencing. Since coming home, I occasionally find myself wandering in the Japanese section of Boston’s Museum of Fine Arts (MFA). While the kimonos and swords are works of art and poetry themselves, with their elegance and attention to minute detail, it is the woodblock art, ukiyo-e, which grasped my attention and made me want to learn more. Two of my favorite artists are Hokusai and Hiroshige. Today I’ll tell you about the first. 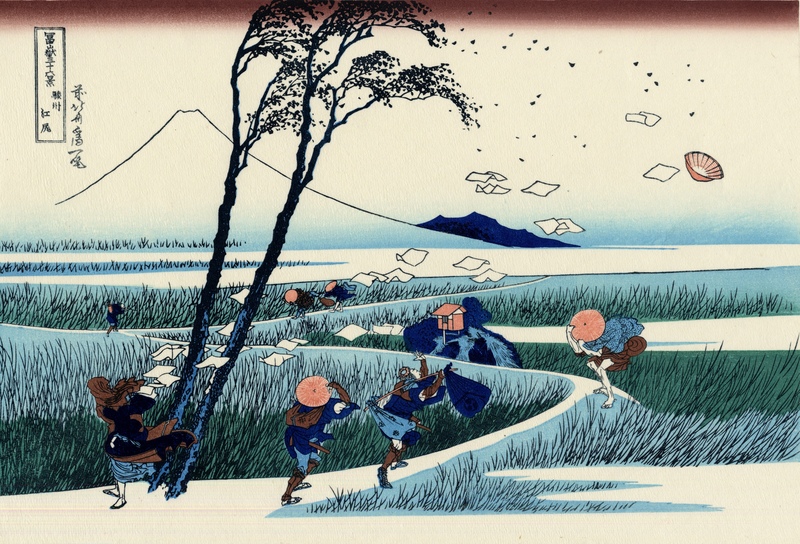 Katsushika Hokusai (1760-1849) made many different kinds of sketches and woodblock art, from portraits and still lifes to erotica and illustrations for humorous poems, but what he is best known for is his landscapes, particularly his two collections of Views of Mount Fuji. Most people are familiar with the “Great Wave off Kanagawa” (I even have a T-shirt of this! ), but some of his less famous works offer me the opportunity for yet another Important Excitement/Small Obsession. And lots of poetry. solid and irrevocable against the sky. Spilecki, Susan. “Mount Fuji Seen from Eijiri.” Verve (1996) 8:1. This entry was posted in free verse and tagged Hokusai, Icons and Action Figures (Batteries Not Included), Japan, MFA, ukiyoe, Views of Mount Fuji, woodblock art.